It was an incredible day! Singers/musicians from across America gathered together at Deltona Records in Florida to record my original song, "Taking Back America." AmericasMightyWarriors.org which assists families of U.S. fallen soldiers is beneficiary of the proceeds from the sale of the song and compilation CD. Gold Star Mom Debbie Lee who is the president and founder of AmericasMightyWarriors.org said she was extremely moved upon arriving at the recording studio seeing so many cars with license plates from all over the country. The atmosphere in the studio was electric; a variety of bands, singers, songwriters and players representing numerous musical genres from rap to country and everything in between all meeting for the first time. And yet, several attendees commented how much the historic recording session felt like a family reunion. The common thread which bound us all together was love and a belief that America is the greatest nation on the planet; a desire to support our military and their families and a strong opposition to the Obama administration's socialist agenda. I began the recording session with a welcome and thanks for attending. Then, Rev. Walt Mentzer started us off with a beautiful prayer. I told the crowd I was grateful we were still free to pray in public. But, what really set the mood and inspired the singers was Debbie Lee emotionally telling the compelling story about how her son, Marc Alan Lee lost his life in Iraq heroically saving the lives of his buddies. Marc was the first U.S. Navy Seal killed in Iraq. While some fought back tears, the choir of 100 singers passionately and enthusiastically sang the choruses of "Taking Back America." Then, we began recording individuals each singing a solo line of the verses, similar to the way the music community recorded "We Are The World" in the 80s. 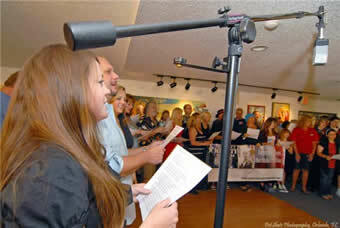 Those selected to sing coveted solo lines were band lead singers and singer/songwriters. Everyone was moved by the feeling of unity and family in the room. Jeff Bruzzo of ProjectShiningCity.org captured the mood on video. After we recorded the choruses, the choir was free to leave while we recorded the soloists in another room. The choir stayed and fellowshipped. Even though the number of bodies in the building challenged the capacity of the air conditioner to keep up, they all stayed, laughing and chatting with smiles everywhere. Friendships were formed, inspired ideas for action were birthed and collaborations were planned. Eighteen of them went to dinner and conversations continue well into the late evening. Who were these guys? They were "We The People" musicians doing their part to restore and preserve our freedoms, liberty and culture. It was truly wonderful. Wandering through the crowd, my ears caught snippets of their stories of businesses lost thanks to Obama. They talked about the specific Obama outrage which pushed them off of their sofas and caused them to pick up their guitar, start blogs, start radio shows and form organizations. Along with the "Taking Back America" song which we sang together, the compilation, "Tea Are The World" CD will include original songs recorded and submitted by bands and solo artists from around our country. Five time Emmy Award winning producer, Norvell Rose shot footage of the day's activities for a "Making of" documentary and a music video. By the time, Frank Starchak, music producer/recording engineer had completed recording the last solo line of the song, I was physically and emotionally exhausted. With tears in her eyes, Debbie Lee gave me a huge hug and thanks. Debbie again commented on the warm feeling of family that permeated the atmosphere. From long haired white rockers to grandmas to black r&b singers to teenage rappers to seasoned music business professionals, the conduit was our love for America and a desire to support our troops. I was truly grateful to God for pulling it all together. A brief back story. I have attend over 200 tea parties across America on three Tea Party Express tours. In every state, musicians approached me with CDs of their original songs while expressing their desire to be a part of the incredible Tea Party Movement. Several months ago, while on Tea Party Express II tour, I decided to write a song and record it "We Are The World" style with musicians from across America. But, who would be the beneficiary of our efforts? Debbie Lee joined our team on Tea Party Express III tour. Between rallies, while riding on the tour bus, Debbie told me about her organization which supports the families of fallen soldiers and her challenges regarding funding. Our conversation inspired a eureka moment. I thought, "That's it!" All proceeds will benefit Debbie Lee's organization, AmericasMightyWarriors.org. The true hero of the day was my longtime friend and master music producer/recording engineer Frank Starchak. I later learned Frank awoke the day of the historic record session with a horrible tooth ache. In true American spirit, Frank fought through the pain and pleasantly recorded the mass choir and all of the solo singers. Frank has also given tremendously to the project. Before recording the vocals, Frank has contributed 30 hours of music production free of charge. He is faced with the huge task of editing the vocals and mastering the over 30 songs which will be on the compilation CD. I would love to find an honorarium for Frank. Folks, I say it again. The "Tea Are The World" recording session was an awesome day and a memorable rewarding experience for all in attendance. Stay tuned for the release of the "Tea Are The World" CD. It will feature our joined performance of "Taking Back America" and original songs by bands and individual artists across America. God bless. Folks, I say it again. The "Tea Are The World" recording session was an awesome day and a memorable rewarding experience for all in attendance. Stay tuned for the release of the "Tea Are The World" CD.